Oh, I do love my numbers. It's something very cool when numbers and graphs get to show you some actual meaning. 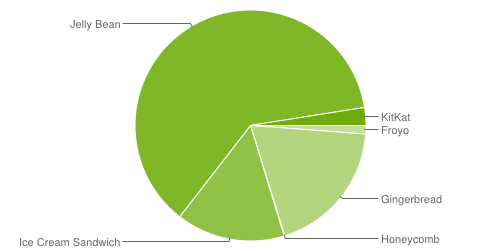 Like today's graph of how many devices on Android are using which versions. I like to compile each of the monthly pieces of data, then I put them together in this growing chart. What I like to see is how the evolution of different versions rise for a while, then crest and start to recede. Like Gingerbread is really on the way out. Ice Cream Sandwich is on its slow decline while Jelly Bean really is taking over. Kit Kat really is growing the fastest of any of the groups I'd like to say.